I’ve written before how I’ll repeat phrases in my head in an attempt to motivate myself to success. My first one was: “How Bad Do You Want It?” I repeated this over and over as I was working on my dual-engineering degrees. Lately I’ve been repeating “Embrace Discomfort.” I do this to force myself into situations where I might be uncomfortable. I know that if I put myself in an uncomfortable situation and embrace it, I’ll grow. This quote came from what I would consider to be one of the best blogs posts that I’ve read this year. Seriously. No. Recognize these desires? Pleasant, tempting, but useless. They don’t bringing us any closer to achieving our goal, so screw them. Once the easy, useless options are gone, what can we do to make some kind of progress? There are lots of different ways to make progress even when we feel all concentrated-out. Sketch out an understanding of the system on a piece of paper, away from the screen. Take the classic short walk; something that actually clears the head and refreshes as opposed to just being a pleasant distraction from the guilt of not working. There are many ways to keep on pushing forward. Exactly. Remove the easy option off of the table. Don’t believe that you can take a short break browsing something and then come back in a few minutes to work. I’ve been guilty of this so many times. Many times when I’m waiting for a compile to finish, I’ve been guilty of firing up Hacker News or some other site thinking that I’ll only be a minute. 45 minutes passes. This has happened way too much. I even built a tool to measure my consumption vs production. It works. Read the article. Take the easy option off the table. Don’t take breaks to read other sites. Be a machine. Build products one by one - and you will win. 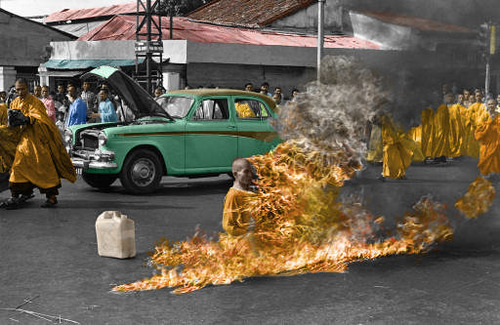 If a Buddhist monk can set himself on fire and be disciplined enough not to move, you can be disciplined enough to avoid distractions to actually get work done.